24 is making my head spin and spit pea-soup. Hubby is home from the land of pay-toilets, bad sausage and choking cigarette smoke. The Wee Highlander is sulking up in his room about who-knows-what. Oldest is enduring finals. Life is back to normal. Or as normal as my normal gets. The multi-lingual and equally talented Fausta, who covers a lot of ground every day, keeps one eye cocked to the south at all times. Kinda like keeping an eye on the smoldering Mt. Doom. Today we see that Queen Nancy is planning a trip to Chavezland. She needs to really stock up on her red hats, ’cause she will need them as she tours the poor and oppressed. Does Hermes make red hats? I wonder….. After all, if you visit the downtrodden, one must look their best. Don’t forget the pearls and gloves, honey. Maybe this time, someone will be paying enough attention to ARREST HER when she comes back into the country. This time, for the second time, for violating the Logan Act? She wears her sedition like a medal. Remember those commercials from your childhood, about blasting caps? How if you found them, don’t touch them? They could blow off your hand or kill you. That’s the road she’s headed down. 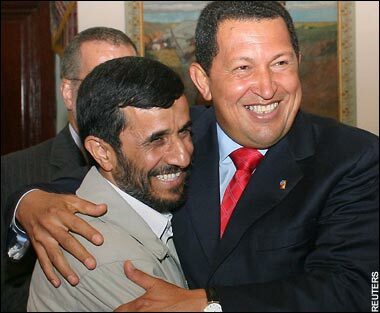 Along with Chavez’s little friend, his favorate playmate – she is playing right into their hands. The Anchoress is back! Writing about GW hoohah, Tenet’s convenient justifications, and everyone’s favorite GasBag. Pull up a chair and read awhile. She’s worth it! Our enemies see how distracted this country is and who is doing all the distracting. And they are waiting – just like a spider. Siggy includes a flowchart at the end of his post celebrating the the Dem’s bad day. Too bad it can’t be posted at every school in America. While you’re there read the post on Corruption? You Want Corruption?. Queen Nancy vowed to end corruption at the beginning of her reign – I guess that only applies to those representatives whose titles are followed by the letter R.
The Red Hat Society – BRILLIANT!!! I just found this blog, and don’t really know what it is about, but you have put two of my interest together: the Red Hat Society (I’ve been an official Rambler for 15 years or so [when did it start?]) and Latino Americano. My work (mission if you will) is with the poorest of a very poor villa jovenes outside or circa Lima, Peru. I have been trying to get red hats on my abuela as well as on those in one of the rich parishes in Lima that donates to us. My question is: how do you explain “fun” to wome4n who have only worked, and how do you get them red hats???? Abuelas (around 100 of them) ;please see http://www.adopt-a-grandparent.org.